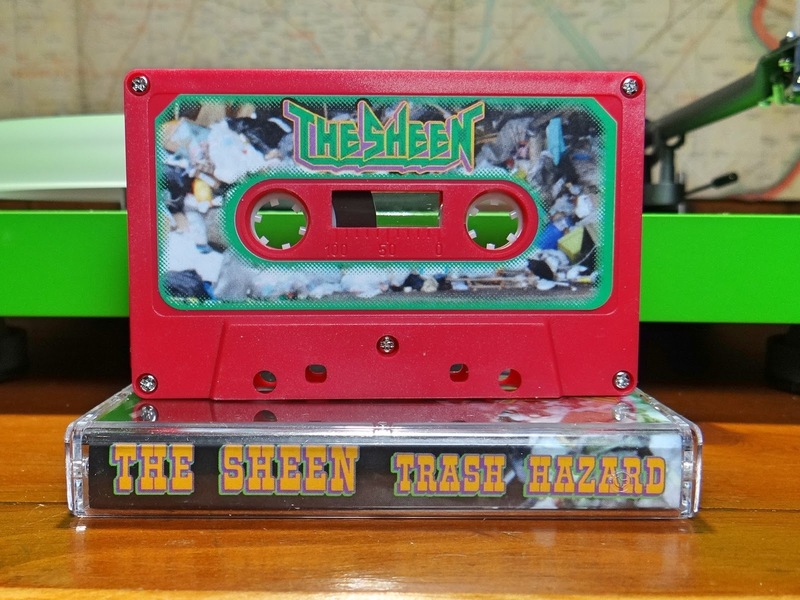 When the the world falls into shambles and the new breed of nomadic rovers rule the land, The Sheen is what they will be listening to. Why has music taken this form? Maybe there is no love left for soft jazz, pop sounds and country jangle, or all has been lost. From what was once known, to what has come to be, continual pounding and saw like strings slicing and separating, building sonic splendor in the antithesis of order. Constructed from a demolished society, this is the new emotion, shaped and welded together, forming a jagged medium to probe terra firma. The wastelands are a formidable place and The Sheen is establishing their ground. Seven tracks in just under half and hour, all amazingly recorded live at the Unknown in June of 2018. Fueled by two drum kits, bass, guitars and synthesizer, Trash Hazard forms an extensive sonic road block on Hwy 108. Entangled beats and rhythms waiting to ambush all venturing forth for food and water. An impassable wall of noise, defying all heavy equipment used to push sounds into specific genres. Trash Hazard only slightly settles down for one track titled, M. Corner Tone. Everything on both sides of this track, wasting consciousnesses and cluttering thoughts. Perfect for the rebirth of society. Released in September of 2018 by The Sheen themselves. In an edition of one hundred, copies are currently available. From Bellingham, Washington, be sure to see this band live if this is your area. Comfort Food, Already Dead and Darko the Super all gather at some street light lit New York City crossroads. Just up the side walk, a stack of boxes and clutter has accumulated from an adjacent building. Within this debris, all look to see a faint glittering ray of light break the darkness as distant headlights cause a reflection. Upon closer inspection, this unwanted refuse is the last remaining collection of music discs that shimmy before their eyes. Everyone fills their arms and walks away Grunting a MacGyver tune. Reaching haven, a whisper permeates the room, "lights out everybody", Comfort Food is going to play music. It is much later than you think and the most ominous enigma is Falling Up A Down Escalator. This is extremely hard to describe, each jolt and bounce, smoothly conveyed back to it's origin. A similar awkward occurrence happened once before in 2017 under the dome, it is still a mystery. The music has been playing now, a gang of four people are huddled around a man playing guitar with snake fingers.... The angular rhythms are a cordial warning to all who listen. Don't run away though, Darko the Super calls out your cheap dollar legs and you stumble. 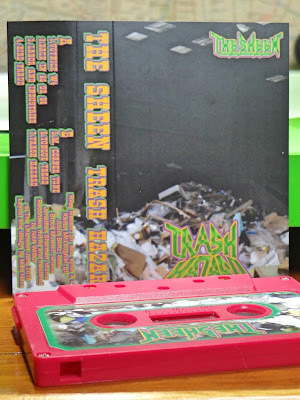 A perfect blend of rap and honed punk jazz, with a little verbal homage to a band with initials S.M. 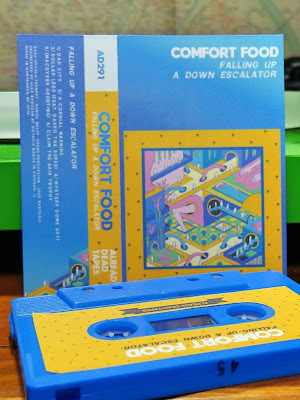 Funny since the entire track screams more to another set of initials, J.C. but those are just the contortions Comfort Food is capable of. From the time dad went to the city, through this entire sonic barrage, the loss of hair trying to describe these sounds is surely not a trophy. 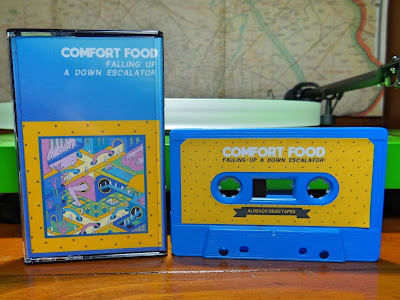 Daniel Wolff and Jake Marshall are perplexing, each track is stellar, but the real truth is, Falling Up A Down Escalator never ends and it never should. 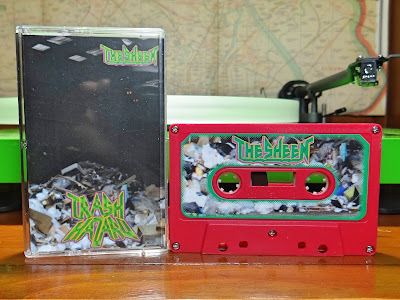 Released on Already Dead Tapes and Records less than a month ago. This is the third Comfort Food album for the label and is in an edition of one hundred. Just checked... of the previous Already Dead Comfort Food releases, only copy from the label remains. This is a very good indication Falling Up A Down Escalator will sell out as well. 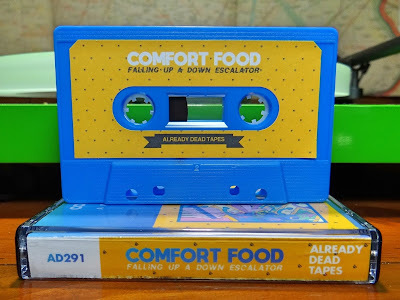 With how good this cassette is, it is definite. 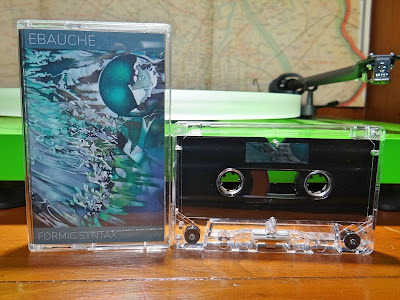 Test the sound waters before sinking in, Ebauche lurks in the depths with the alien creation of Formic Syntax. Droning wash reaching beyond both audible and visible thresholds. Beats and rhythms cruising these vast spaces, like prehistoric predators in a world only fossils can give hint to. 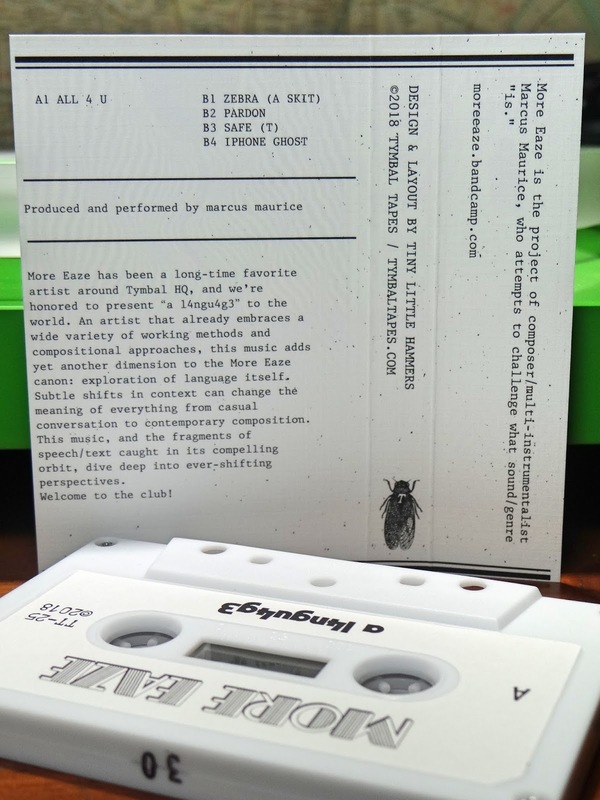 In this paradoxical environment, where the whole of life flourishes over eons and individual life randomly ends in the surprise of a second, Formic Syntax is the soundtrack. Beautiful ambient density, sonic pressure measured precisely, consciousnesses balanced in some ethereal buoyancy. These lengthy pieces are interrupted by digital charges, exploding with angular notes. Ebauche creating both serenity and disruption. 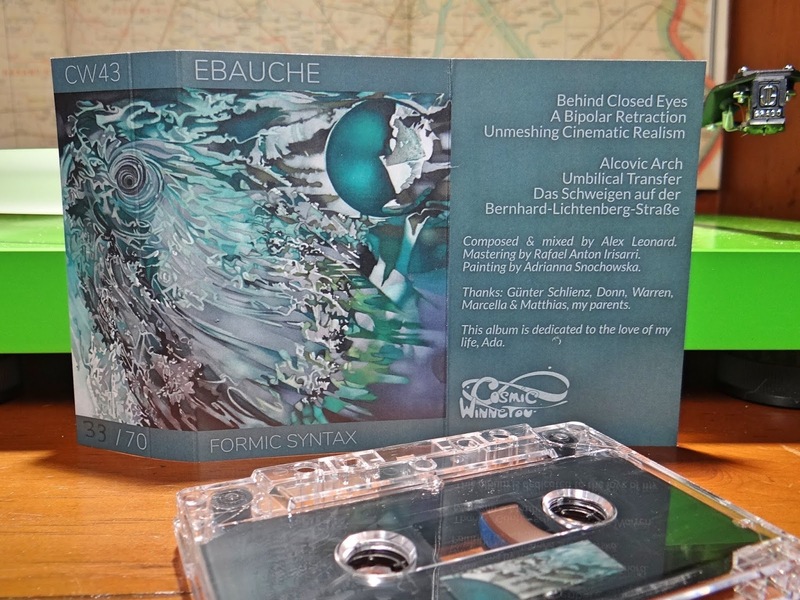 Ebauche is musician Alex Leonard, currently residing in Berlin, with sounds dating back to 2001. Formic Syntax joins another 2018 release title Mutable, making these Ebauche's first outputs since 2015. 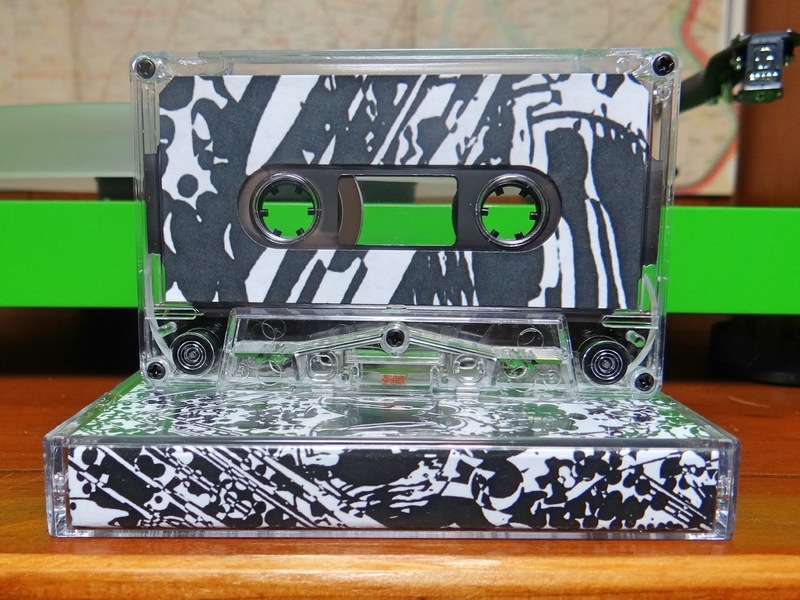 With seven tracks spanning roughly forty five minutes, this Cosmic Winnetou cassette encapsulates the solid spectrum of diversity Eubache reigns over. A slow ambient build up from the start, lost in the tinged hue of an unfamiliar aural atmosphere. The peacefulness steadily fractured, exposing thoughts thought successfully hidden. The mental state in some feverish boil, the mind is being cooked. Ebauche pushes to the bottom, heavy beats compromising any safety features listeners held on to. But just before the inevitable implosion, the sonic weights are shed away. Ambient lightness is heard again, and tranquil states are sustained with earnest gratitude. 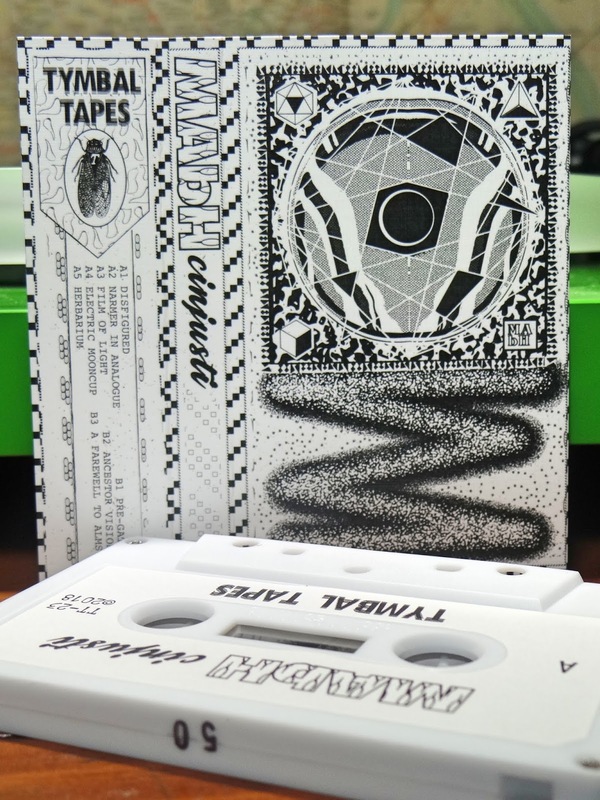 Released in August as part of the fourteenth Cosmic Winnetou Batch. 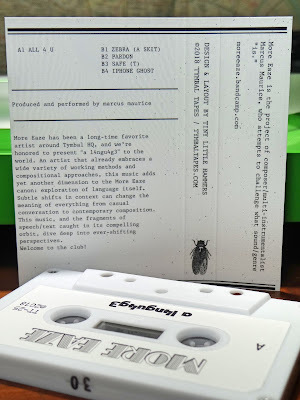 Although the entire batch is not an option, copies of Formic Syntax are available from the label's website. These are some serious sounds, be ready for a sonic dive to new listening fathoms. Finally the explanation surfaces on the creepy clown issue. And how simple, someone just needed to go up and talk to a clown. Thank you Budokan Boys, just wanted to say this straight off because this was something of a mystery. The amazing thing is, clowns are recruiting, an unknown fact. 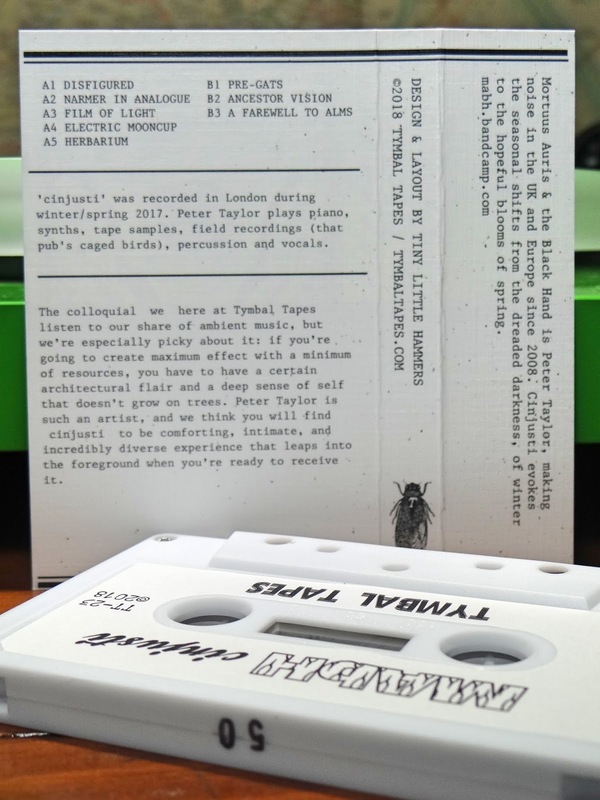 Posing a new question... is this Tymbal Tapes release a subtle promotion for joining this edge of town society? Most pertinent task is to finish describing the four other tracks on this release. All seem to tell a story or describe peoples emotions. The gamete of humor to horrific is explored on this composition. From Old Man Jones and his neglected hungry dog to the super trippy Good Times Street, the diversity in delivery is excellent. Each track simultaneously off kilter and clearly on point. With repeated listens, the well chosen details becoming understandable punctuation in sonic beauty. 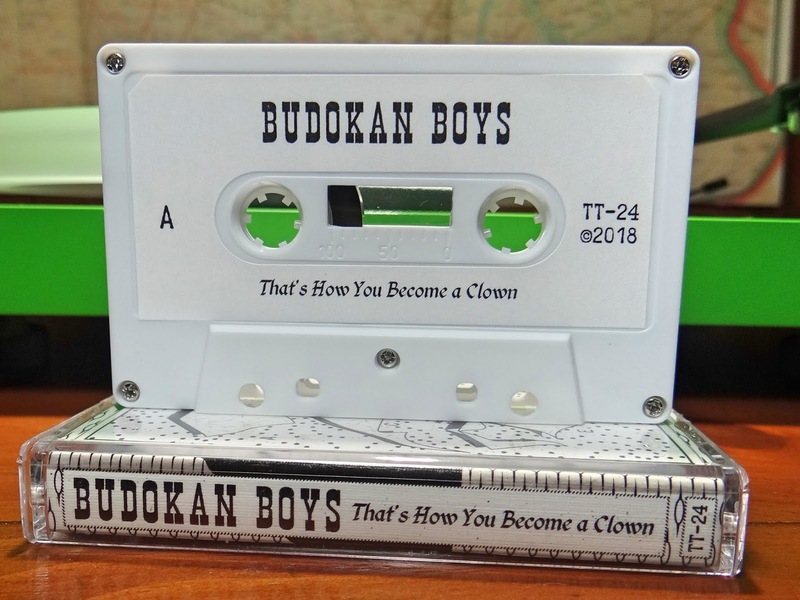 Rhythm, samples, dubs and notable narration make That's How You Become a Clown, a diversion all should follow. A.M. Stations, unmitigated exuberance from first note to last. Channeling rhythms and beats from past decades, Nonsense blurs into the roots of sound. Each track on fire, on the threshold of liquefied metal. 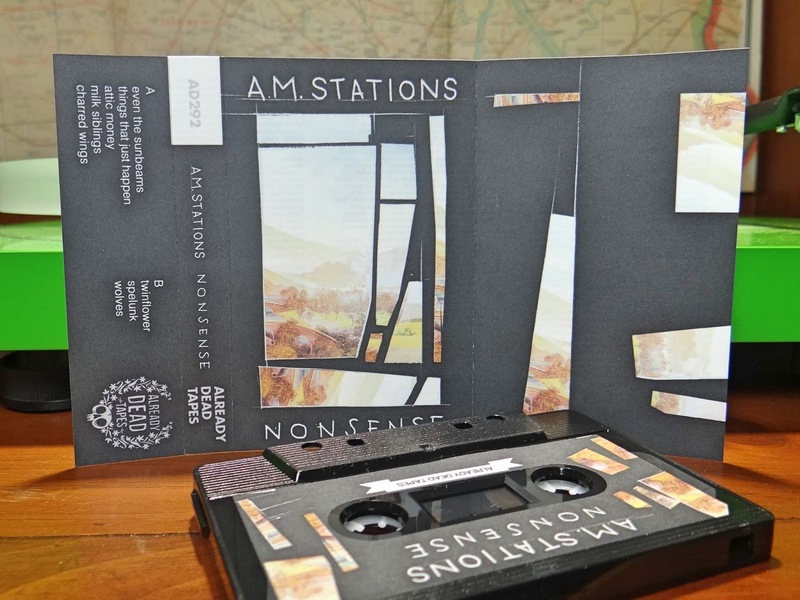 Headbangers feel A.M. Station's presence, but this is not that kind of record. Amazingly Nonsense cruises the main drag with a consistent speed, but continues to morph vehicular appearance. 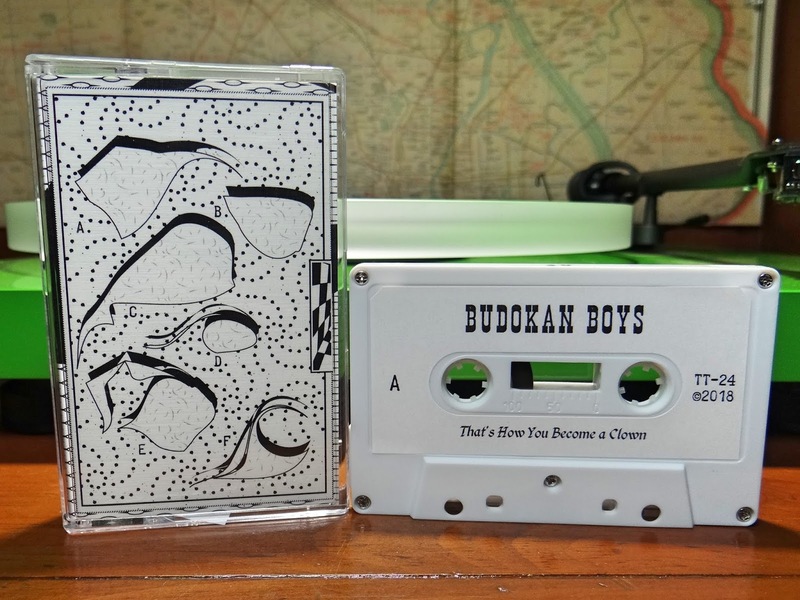 Listen for a second or a sample, reveals just a fraction of the total talent. Take the full tour from start to finish, then listen again to see how much was missed. After flipping this tape a dozen times or so, the elusive comparison that just nagged at thoughts finally surfaced. Maybe it was forced, a last attempt at trying to make A.M. Stations sit down. There is a lot on this composition, so any tackle pining down these sounds really only slows them for a few seconds. Going to throw the mid eighties band Scratch Acid out there.... Touch & Go Records, Chicago, Austin Texas.... All major components of the progressive sonic state. 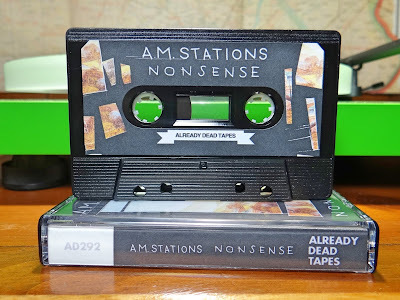 Already Dead Tapes and Records fitting like a perfect puzzle piece to this aural picture. In this single composition, Nonsense has all of the diversity. Heavy bass and guitar trying to play as loud and distinct as the drums and vocals. All sonic elements arriving and departing like the busy rail hub of Hamburg Hauptbahnhof. The last two songs on the first side, milk siblings and charred wings, bring small elements of sedation in, before flying loose. Moments of vocal harmonizing throughout, tether the anguish and noise. Everything together making Nonsense overflowing with sounds and still perfectly balanced. In the depths of the forest, shadows extend in infinite directions, looming over any remaining strands of light. Foot paths and trails blur into the undergrowth, tangible directions dissolving in a living solution of ancient flora. Small clearings do exist and become focal points, allowing radiant energy to gather. The sun like a flashlight against a whole in the wall, illuminating only the diameter of absence of trees. Within this glade, the only warming pardon the landscape will grant until night falls. And the creatures who dwell in thees farthest reaches, use these open spaces. Throughout the days until fires are lit for darkness' companion. Some spaces are used for rituals, others just for connective comroderie, all out pouring sounds for every spirit to enjoy. 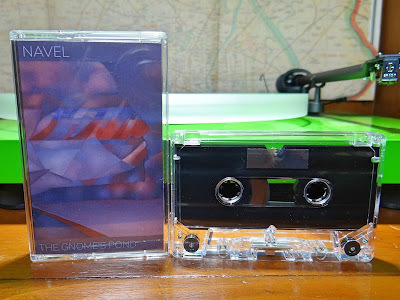 Navel has captured the essence of both reflective and exuberant emotion. Very personal harmonies and ambiance. The Gnome's Pond blends a select sonic aura, sounds from special places the woodlands allow only few to know. Four tracks channeling, each with a different feel and tone, but all channeling activities from a world only few know. Water dripping, hidden insects calling forth, strings played in symbiotic harmony. 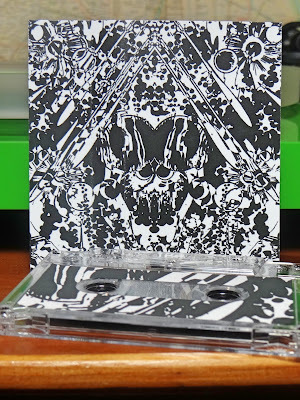 The bulk of The Gnome's Pond are two fifteen minute slow burning tracks, golden orange drone, beautiful but untouchable. These songs change as oxygen is fanned in, small flames of sound springing life above the droning embers. 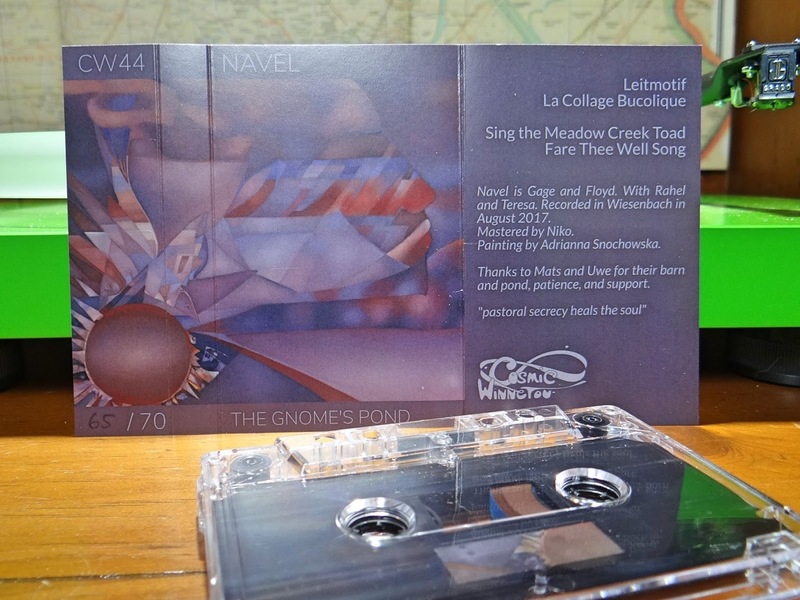 The second track, La Collage Bucolique, shows how talented Navel is. The changes in this piece evoked a memory of the second side of the 1972 album by Leon Russell titled Carney. Specifically Acid Annapolis and also The Masquerade. Extreme craftsmanship picking psilocybin from dimly lit grounds beneath the canopies shadow. The Gnome's Pond has these tendencies all the way through. Beautiful meditative guitar and song writing in consort with fireside ghosts. Flames giving way in early morning hours, the clearing being consumed as all radiant energy is seemingly asleep. Released as one of three in the fourteenth batch from Cosmic Winnetou. 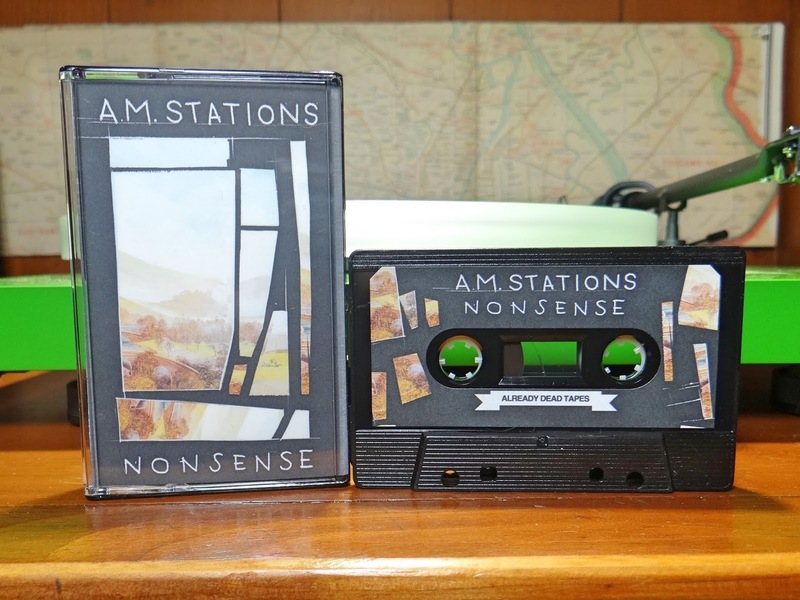 In an edition of seventy real time dubbed cassettes. Copies are available from the label's webpage, or from Navel's bandcamp page. Everything from Cosmic Winnetou sells out, and The Gnome's Pond will as well. 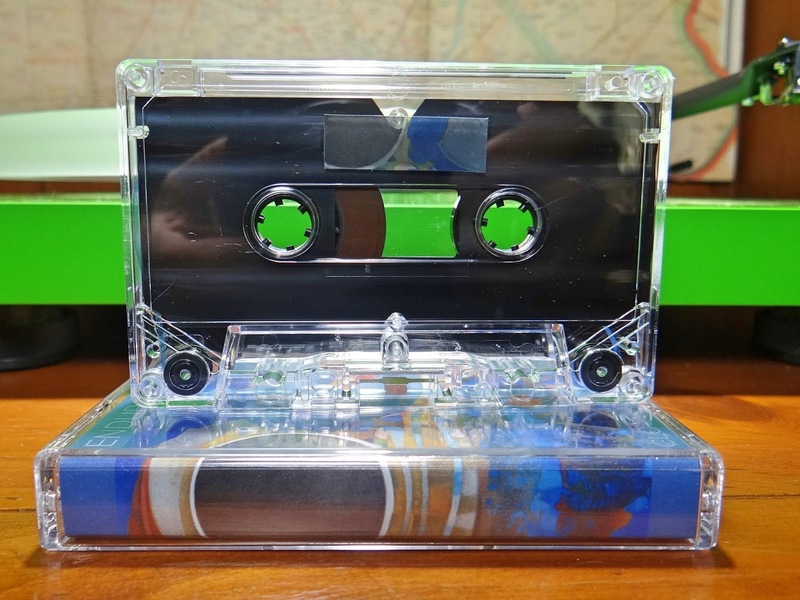 It is actually amazing this description was done while tapes are still obtainable. Mortuus Auris & the Black Hand with one quarter of the new Tymbal Tapes September 2018 four tape release. The aural landscape extends beyond the horizon on cinjusti. Across this vast surface, rhythms expand then condense, like MAbH is in a synchronous connection of aphelion and perihelion. With fluctuating proximity to an energy source, this cyclic element rests in each track. As distance increases, small fires of beats and melodies warm spirits and comfort sonic journeyers. There is considerable closeness in this vastness, even when the underlying tones are shadowed or to far for radiation to reach. MAbH creating both the canvas of ambient tranquility and emotional points for thoughts to affix with. There is far too much music on cinjusti to adequately encapsulate in words. 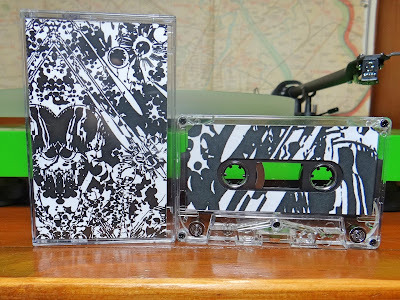 Eight tracks in total, in a mixed division of over an hour. The longest track, Ancestor Vision clues in on the sentiment held for the course of this composition. There is a nostalgic undercurrent forcing sonic spirits to the surface. Almost all tracks have a congruence expressing this notion. The use of slow beats, sometimes reach sounds not far from tribal or ritualistic aural substance. MAbH maintains outstanding fluid diversity for the course of this recording. The second track, Narmer In Analogue, communicates how deft the changes are, all within one track. The entire composition following suit. With a selective assortment of sounds emerging from beyond the horizons, cinjusti is another excellent example of how accomplished MAbH has become. Thank you Peter Taylor! 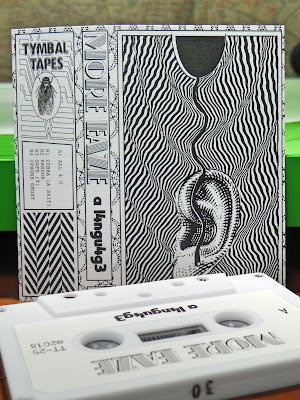 Going to the tape vault and following this listen with Massacre in Catena Valley, 1971 on Space Slave Editions and then, Omicida Della Regina on Stunned Records from 2009 (cannot find a stream for that one). 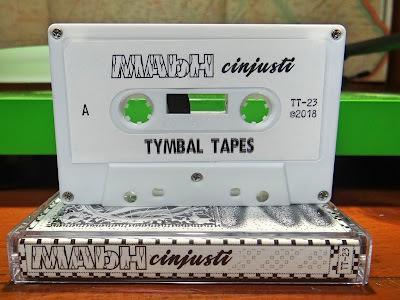 Released on Tymbal Tapes with limited copies currently available. 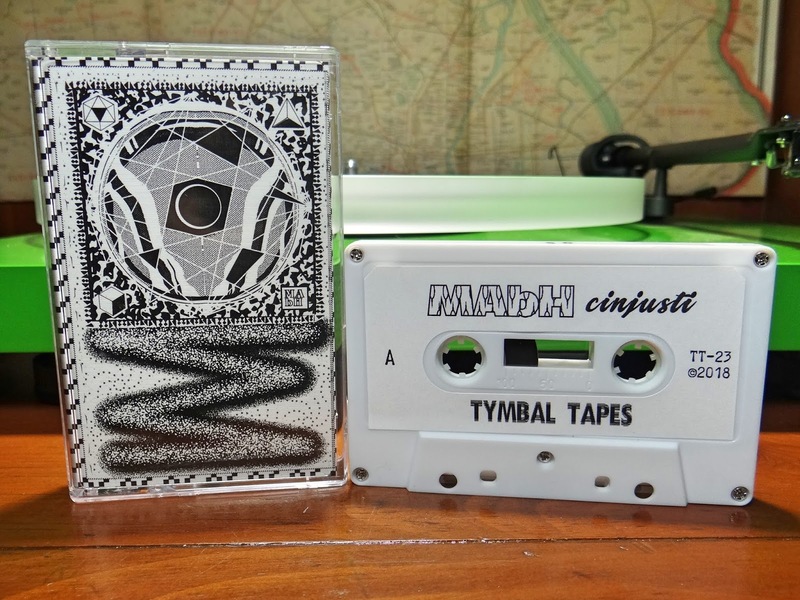 cinjusti was originally self-released last year on CDr in an edition of ten (sold out). Ryan Masteller had an excellent write up of this on Critical Masses. 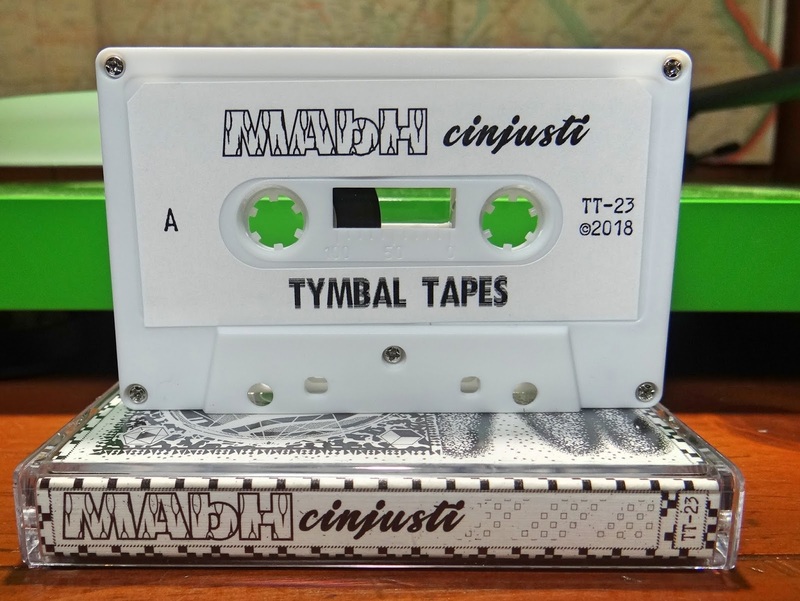 Do not miss this Tymbal Tapes release, they will be sold out very soon. 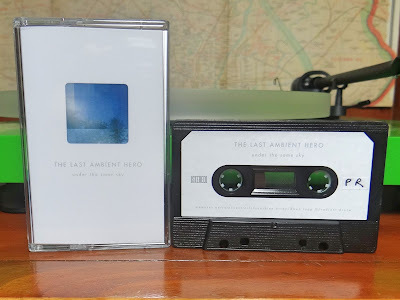 Of the twenty-nine or so releases so far, all but the last batch are sold out from the label. In the forests of Virginia, molecular density is being sliced with the seldom used four man cross cut saw. Teeth arranged bidirectionally, each two second pull shredding living layers decades took to create. The consciousness is arboreal in essence, age building concentric rings, time creating protective mental barriers. Thought structure behind years of experience, well adapted to prevent unfamiliar sensations direct access to the spirit. 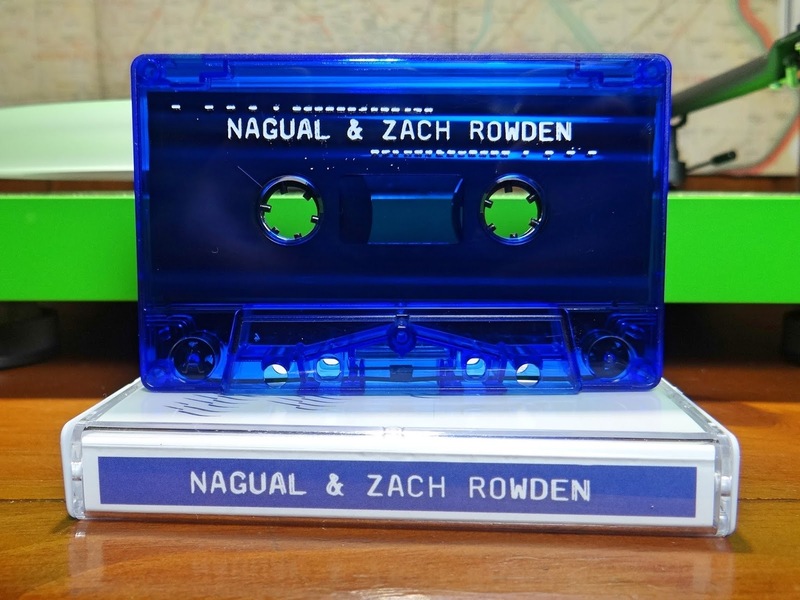 Nagual & Zach Rowden wield the equivalent four man cross cut saw in sonic form. Their collective sound finding the path straight through to listeners core. Two side long tracks on this composition. 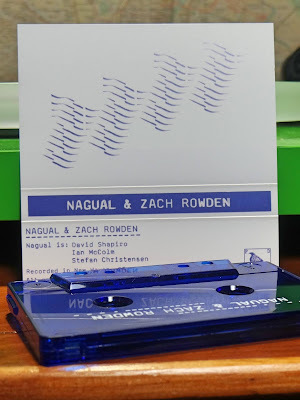 Four talented artists, Nagual who are David Shapiro, Ian McColm, and Stefan Christensen, all playing guitar. And Zach Rowden playing the electric bass. The first side cuts the constructs mental fabric. Sustained notes and feedback at a pitch burrowing straight through the any tranquil hand holds. The entire side somehow epitomizing experienced laid back delirium. Nothing seems overdone or forced. The second side begins with a slow resonating build up with droning bass. Menacing guitars circle like birds of prey as the bass emits a sonic resonance all are attracted to. The attack tears into all who listen, leaving thoughts exposed to decomposing forces. Released in the last part of August in an edition of one hundred and six. 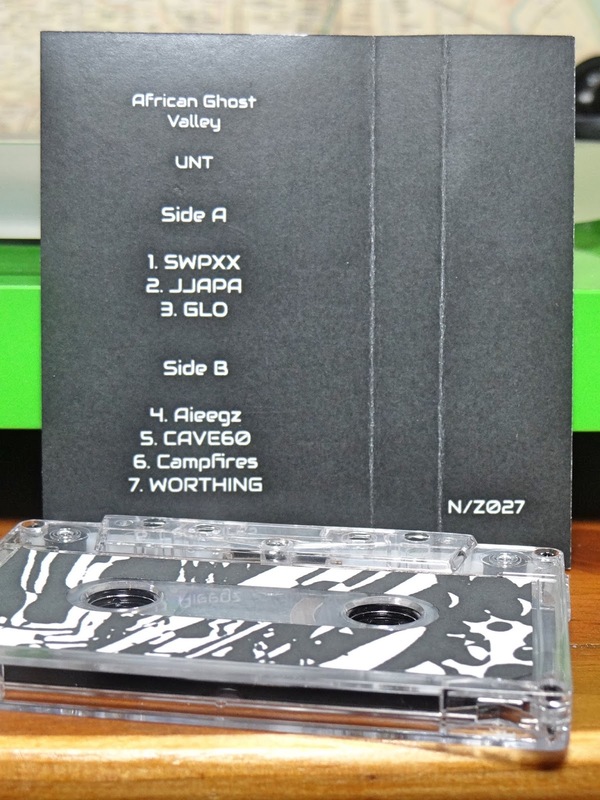 Copies are available from Pidgeon Records. 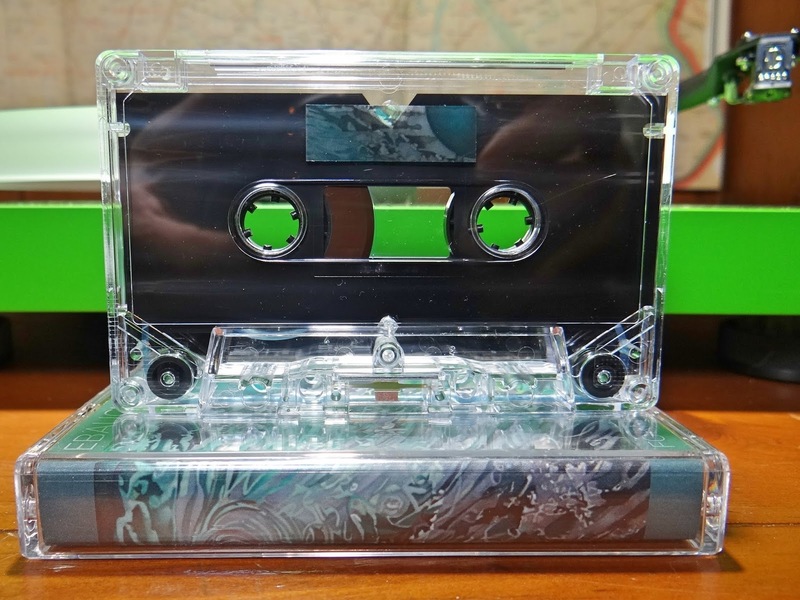 Looking at previous releases and quantities, this cassette should sell out relatively quickly. 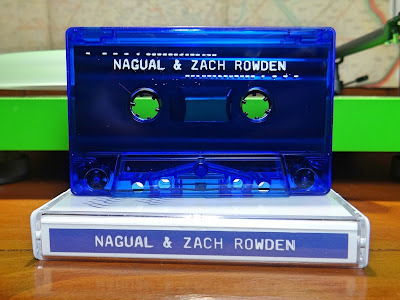 Nagual & Zach Rowden have been making music in many different fashions for a long time, earning a very solid following. Immense distances across space and time. So much detail, the consciousness begins to blur both peaks and valleys. This results in a droning conglomeration of fantastic features. The elements constructing this aural landscape have been sleekly converged, like disappearing ripples across water surfaces. The sound created, a cohesive force of sonic beauty, holding all unheard energy in comprehensible order. Four tracks across forty minutes of sound. Endurance (Joshua Stefane), using creative spacial imagery with ties to the writings of Vladimir Nabokov's short story, Cloud, Castle, Lake. Three pristine features, each conveying their own magnitude of elements. Synthesized together and transitioning to a velvety colossal scope. The idea of individual aspects incorporating into complete ambient landscapes touches on all music of this genre. For Cloud, Castle, Lake, infinitely small eddies and vortexes, all part of the dense flow, each existing in the current they are generated from. Single moments uniquely distinct, like individual snow flakes settling together to cover the countryside. Endurance has taken these vastly detailed instances and created a sonic picture of desired obscurity. 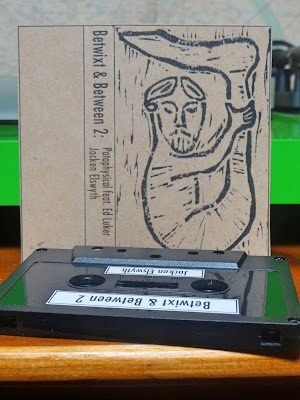 Cloud, Castle, Lake is released on the German label Cosmic Winnetou. In an edition of seventy copies, these were quickly sold out. 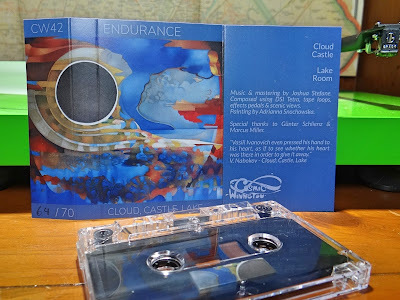 You can listen to the complete composition on Endurance's bandcamp page. The beautiful artwork was created by Adrianna Snochowska and is available. This composition has not surfaced for sale elsewhere, maybe someone knows a source? 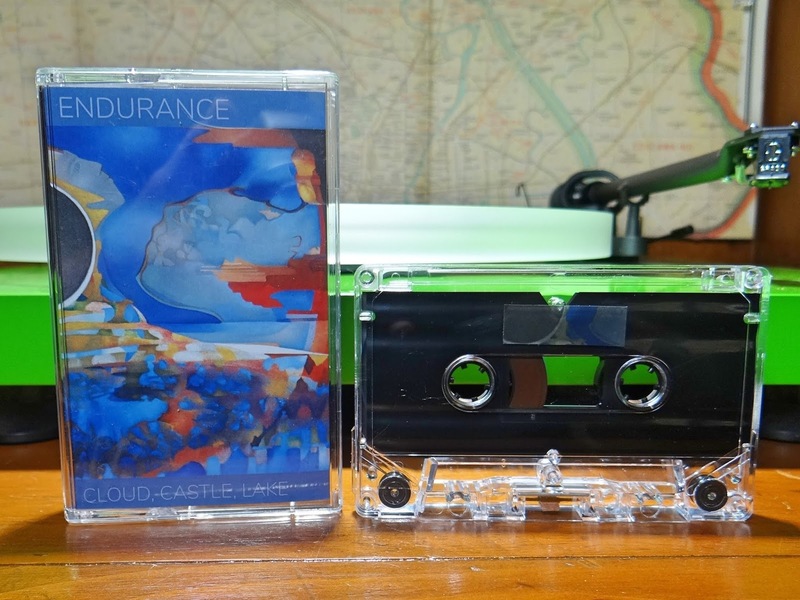 There is a new Endurance cassette on Tymbal Tapes with copies currently available. Celestial Governors will be described on Lost in the Sea of Sound in the short future. Hypnagogic thoughts or maybe they are hallucinations. Voices relaying a coalescence of affirmation underlined with ulterior motives. The consciousness, like an aperture slowly being rotated in opposite focal directions. What were constructive messages, "It's all about you", transition seamlessly to gentle chaos. 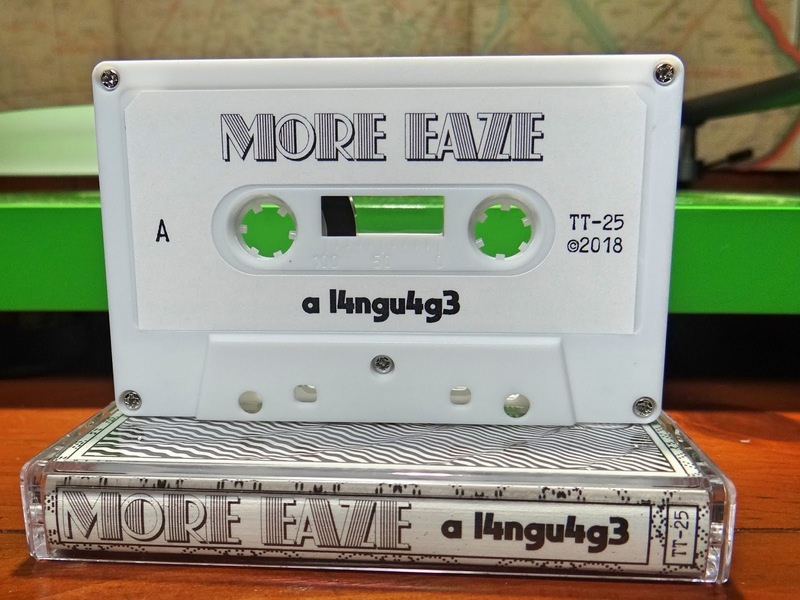 More Eaze is selecting the settings, exchanging the droning insect world for a vivid sonic image of mutated beats, rhythms and sound samples. The entire experience accompanied by subliminal sleep recordings, whispering "relaxation, falling asleep". And then, the continual click of possibly a lethal weapon? Hopefully reality will not be noticeably altered when awake again. 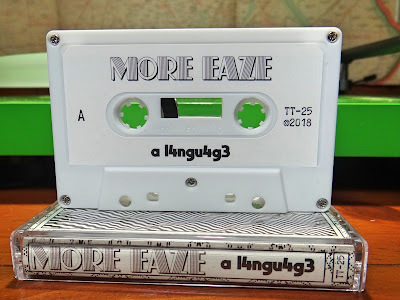 The opening paragraph describes All 4 U, track one, side A of the new More Eaze cassette titled a l4ngu4g3. Whew! Well worth every, hopefully, translucent description. A genius track that embodies the treasure of sounds. The second side follows suit with four shorter offerings. Zebra starting the melodic motion, everything pop music should be, clever, catchy and creative. More Eaze only surfaces briefly with this opening track. The listening masses are harsh about what pop music is, a new haven for creative expression needs to be re-established. With this, the remaining songs plunge into the unpredictable fathoms. Pressure and intensity increase as sound waves condense and energize. Here, and especially on the last track iPhone Ghost, the melodies are at their most relaxed and natural state. The collage being pulled towards a rectangular, pocket sized, piece of glass. A small portal collecting every sensation available as listeners are tranquilized by the sonic implosion they hear. Give some thanks to More Eaze (Marcus Maurice) and the Tymbal Tape HQ for bringing this delightful composition to material form. Excellent from every aspect, originality, the quality of sound, and the art work by Tiny Little Hammers. Released in an edition of seventy five on the first day of September. Copies are available but becoming limited quickly. The world in sound moving overhead. A bridge crossing high above, tossing noise down like rocks being thrown from childhood's whimsy. Passing vehicles causing suspension cables to pop and shudder. Their motors in some symphonic harmony with the noise of tire tread on the smooth surface. Listeners can not see these aural causes, only rest in the cool shade and wonder of a civilization in motion above. African Ghost Valley (Childe Grangier and Gabba Boy) is the source of this sonic rain. A precipitation of echoing discordant sonic arrays, pleasantly turning imaginations for their origins. 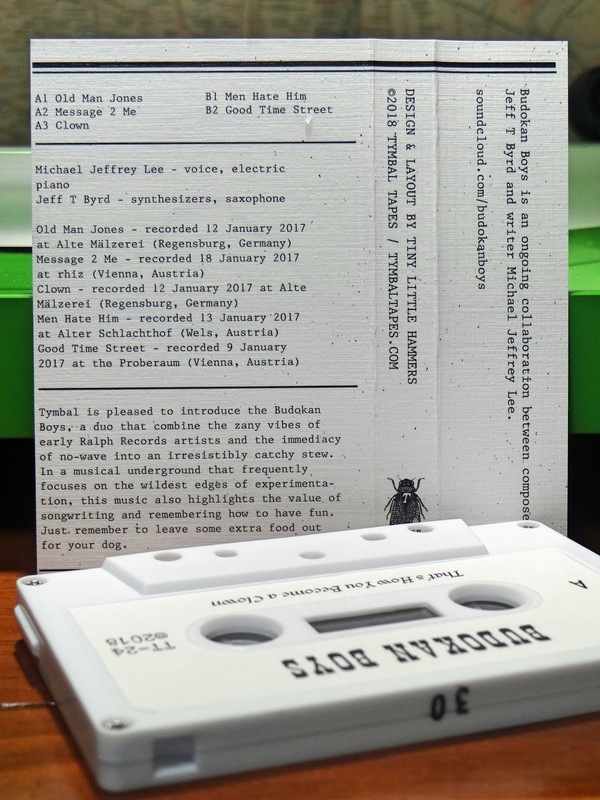 With compilations on labels across the globe, the Athens, Georgia label \\NULL|ZØNE// has given harbor to another world traveler. 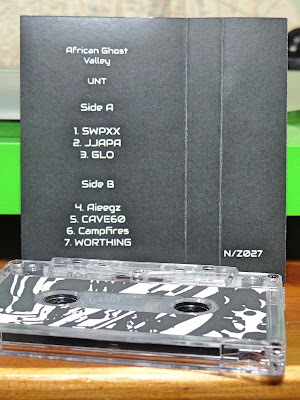 UNT is a really short stay, the complete event captured on a sixteen minute cassette. Deep reverberating bass tones brushed with electronic splatter. African Ghost Valley maintains their complete unpredictability, like a radio dial changing frequencies emitted by distant planets. With the amount of cacophony each new signal secures, UNT as a whole preserves a state of concord. The underlying substance making African Ghost Valley such a delight to listen to. 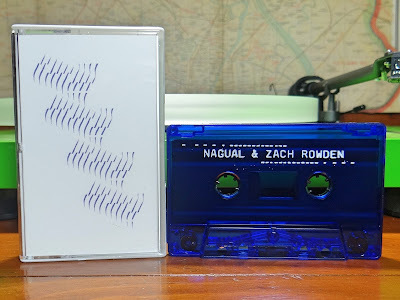 A mid August \\NULL|ZØNE// release in an edition of fifty. Copies are available from the label's bandcamp page. Lost in a Sea of Sound described African Ghost Valley once before on a compilation release on Never Anything Records. A very nice thrill to see UNT come through. The Last Ambient Hero has been working diligently over a three month period. 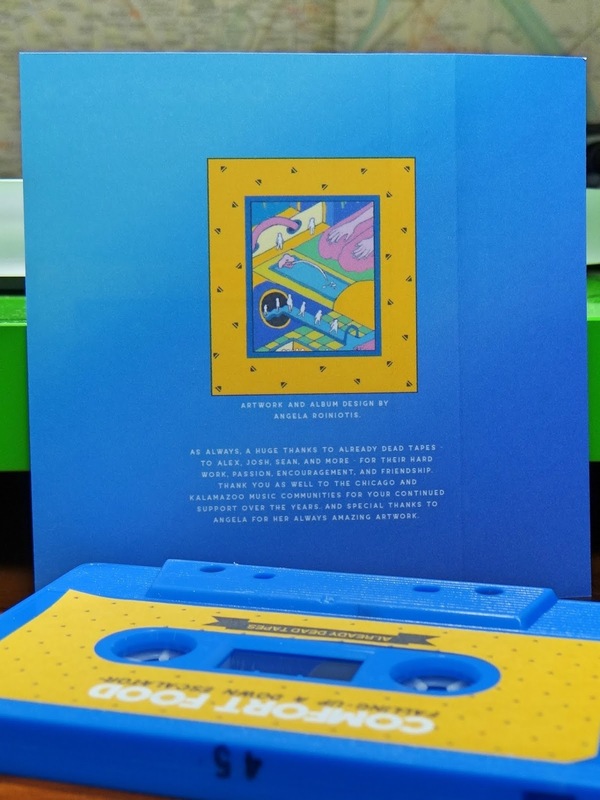 Recently Lost in a Sea of Sound described the beautiful cassette Cassini • Trappist​-​1. Now, under the same sky has arrived. The information given indicates this new composition is a project based in tape loops, a dedication to artists with roots in subtle sound manipulation. And for cassette enthusiasts, a real time recording with three extra tracks not on the digital. The quality of ambient recordings has always been a rather mute point. 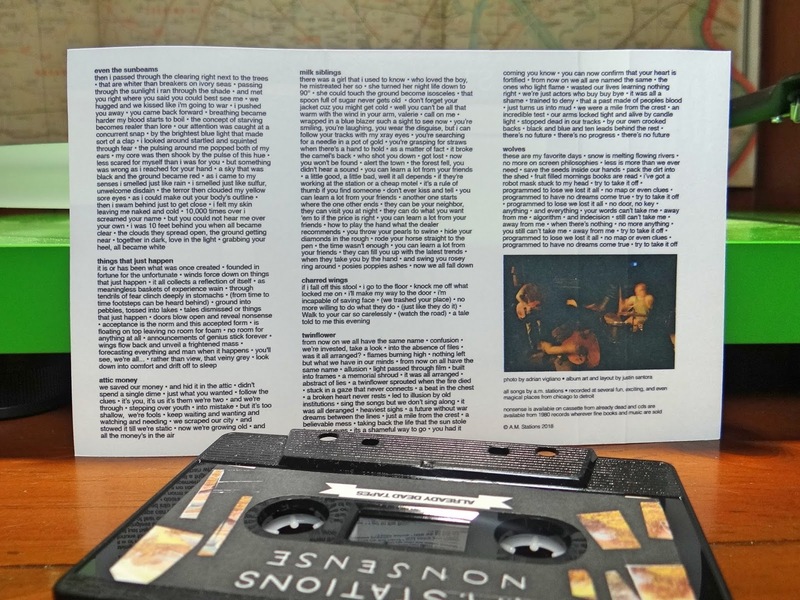 There could be differences from a live session, field recordings, something done in a studio, albeit analog or digital might be a controversial factor. For most compositions, sounds are directly fed into the collecting sources. 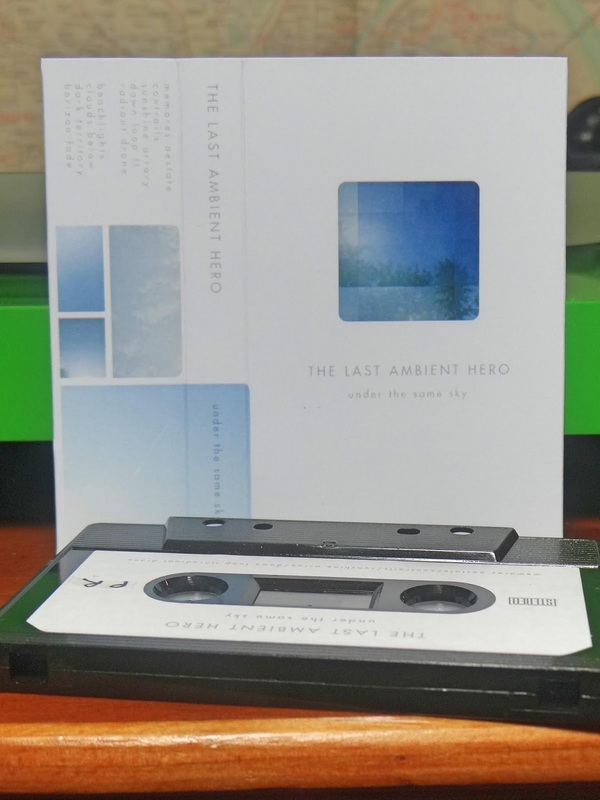 The Last Ambient Hero has accounted for this, rendering twenty cassettes dubbed at real time speed. There might not be a grandiose determinable result from fast or slow dubbing, but these attentions should be noted and reflect the underlying love going into creative en devours. The beauty of under the same sky rests directly with tonal spaces. For anyone listening to ambient music, past or present, each recording elicits a mood. The most difficult place to hold on the spectrum of feelings is the center line. The Last Ambient Hero achieves this, allowing listeners to explore both worlds. 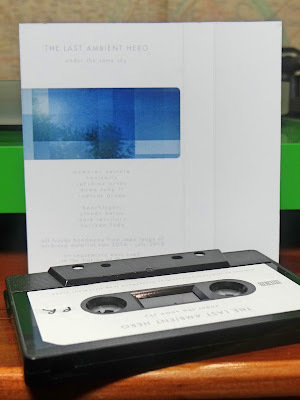 From the uplifting sonic ethereal aura, higher vibrations impart, to the darker tinged broodiness, heavy ambient compositions pull from, under the same sky pins ever so slightly to either condition. The flip of the tape seems to be the juncture where the tenor gently swings. 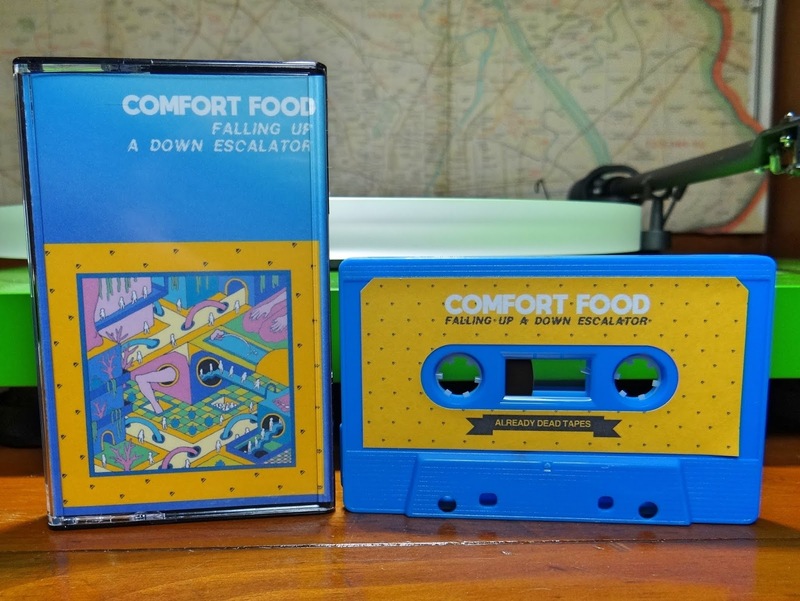 Compare the last tracks on either side, "radiant drone" and "horizon fade", to hear the subtle differences. Consciousness have a resting place, a cliff space allowing sounds to arrive from both what lies above and deep in the valley below. Self released in an edition of twenty, just a few weeks ago. 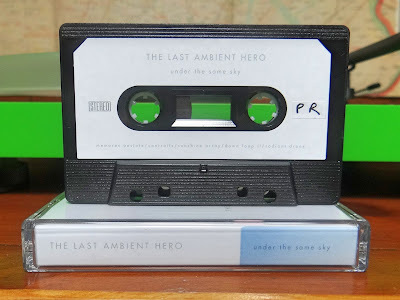 Copies are available from The Last Ambient Hero site. 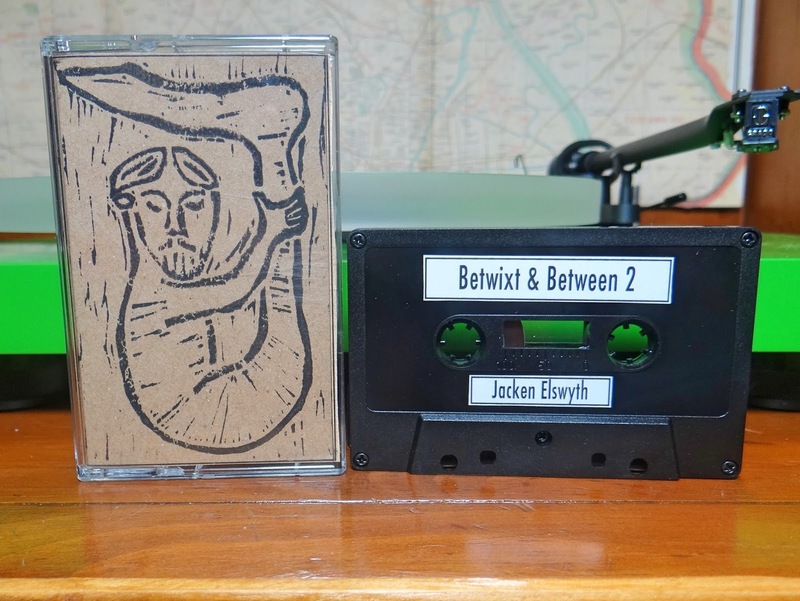 Betwixt & Between 2 is a beautiful foray across multiple styles of sound. 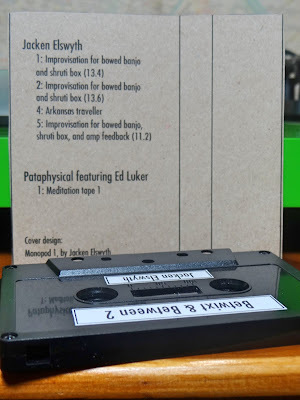 From the opening improvisation using a bow to play the banjo, to the final track, a course in deep meditation, theses sounds will be sure to find porous entry into all consciousnesses. With this great diversity in an aural landscape, the temperament remains perfectly constant. This group of artists creates a micro radio show which you hope the turn of the dial will find. One the first side, Jacken Elswyth charms her banjo, evoking mesmerizing sounds for all listeners. 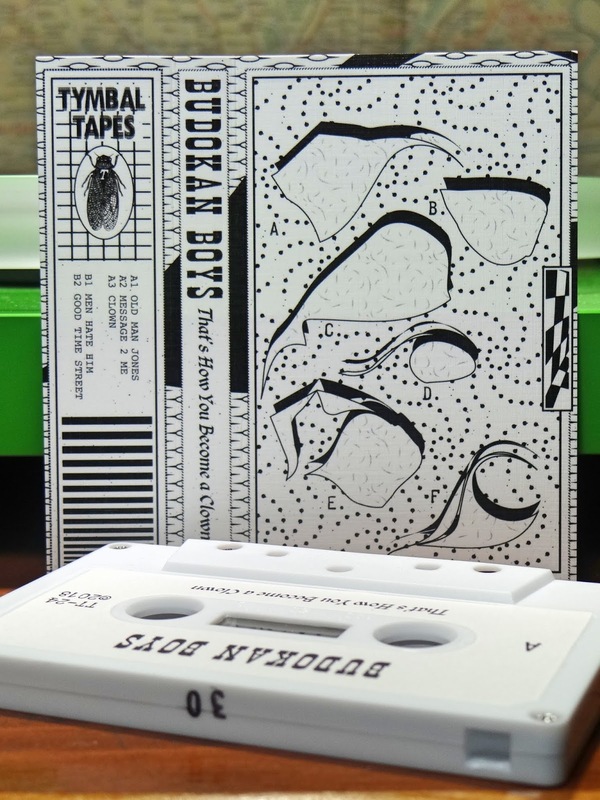 Four tracks in total, one traditional, titled Arkansas Traveler. The other three, similar improvisational tracks with accompaniment by a shruti box for a drone component. 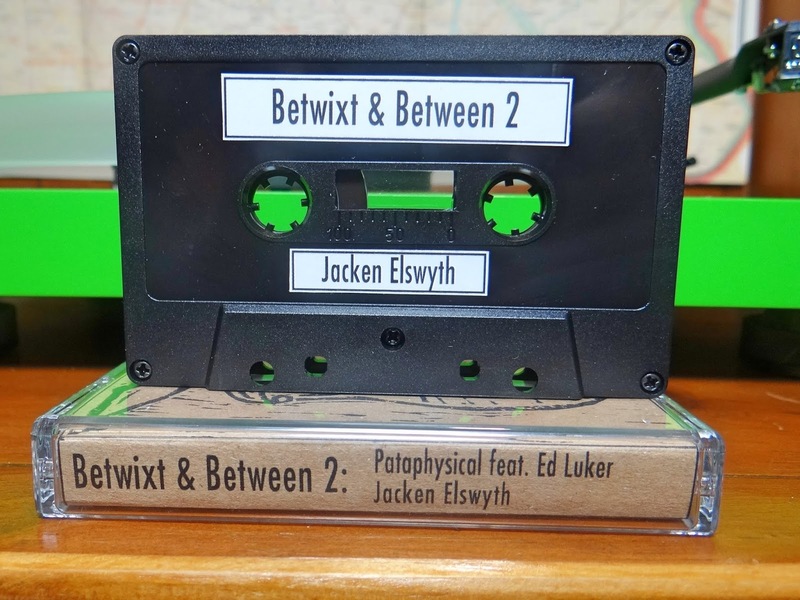 On Jacken's fourth and longest track, she uses an amplifier and feed back as well, adding another layer to an already entrancing euphony. Interesting Arkansas Traveler was selected, since this is a more popular fiddle tune than a pickin' melody, and this was played without the bow. With Jacken Elswyth's knowledge of music, there is indeed a purpose. Truly superbly fused folk sounds from Indian sarangi to early Appalachian banjo. The second side maintains meditative qualities with different artists and an entirely alternative approach. 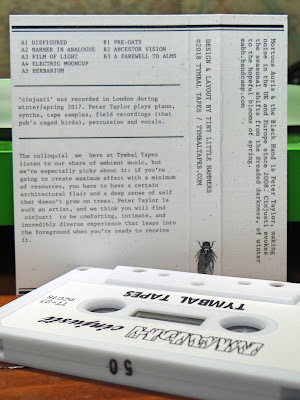 Listening to a combination of Pataphysical, a group of three musicians from London with foundations in experimental electronics. 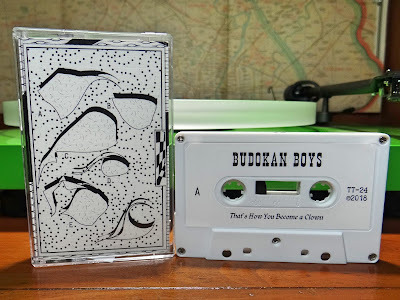 Their sounds are the richly covered canvas for Ed Luker's instructional brushes of relaxation techniques. His spoken words are an amalgam of both methods and descriptive observations. Trust Ed as he opens the mind to the garden he wants us to experience. 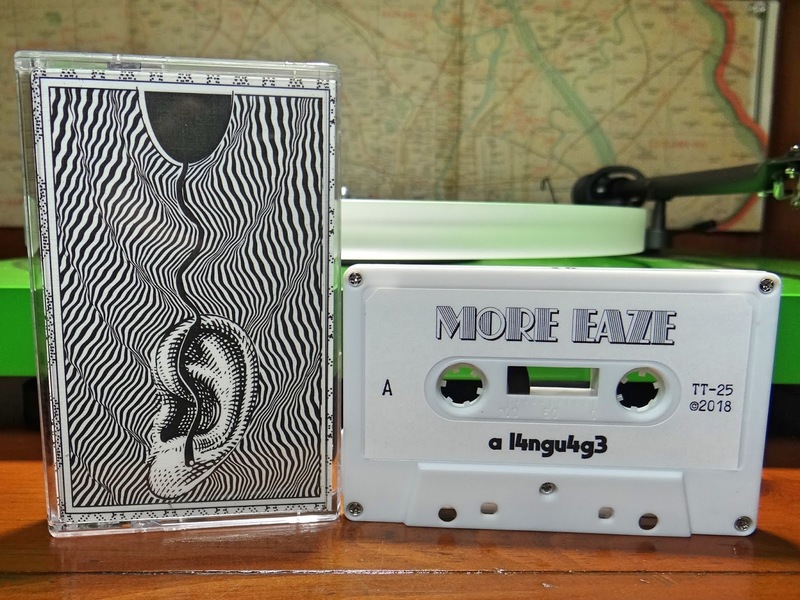 A restful place for listeners to ponder Ed Luker's visions. 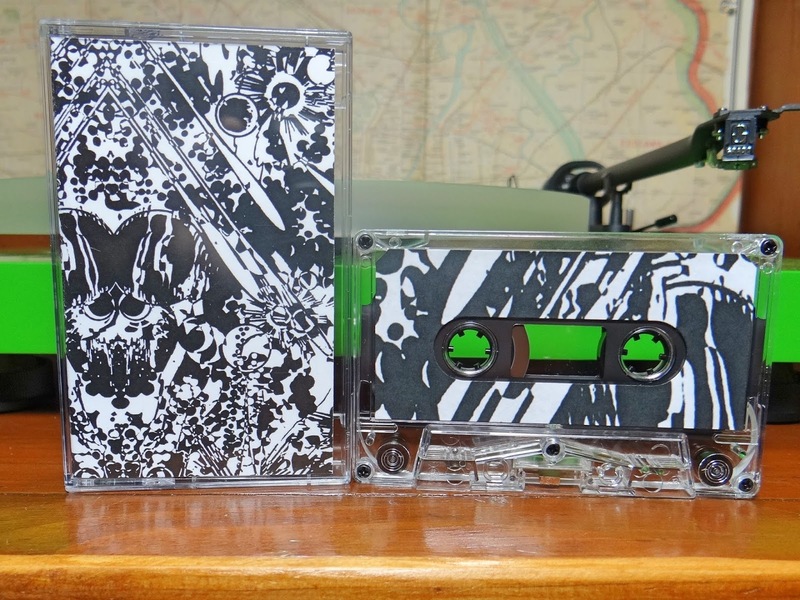 Released on Betwixt & Between Tapes in a few different versions. 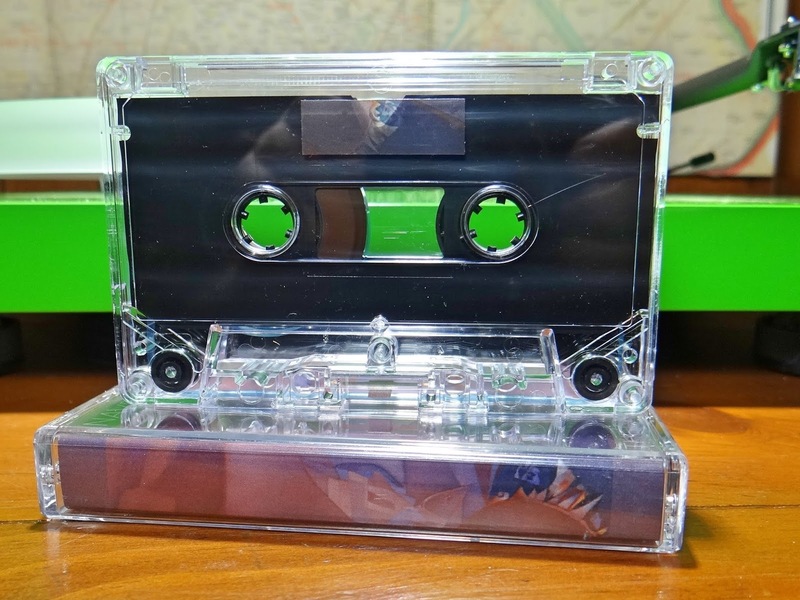 The cassette is the material form used for this description. 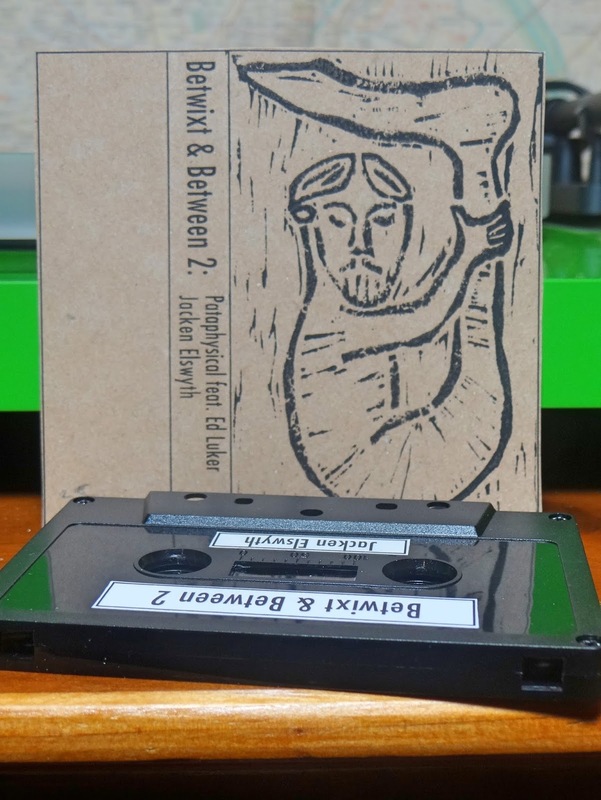 There is a cdr edition and also two hand-carved linocut with hand-pulled print versions on high end recycled card stock, individually numbered with digital download as the sound source. 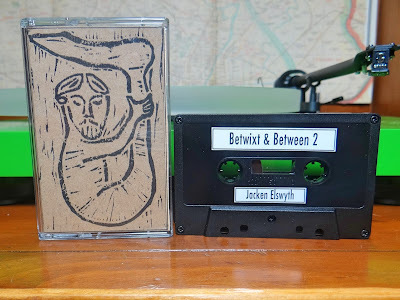 Thirty cassettes in total with Betwixt & Between 1 already sold out in tape version. No procrastination if you want a physical copy. 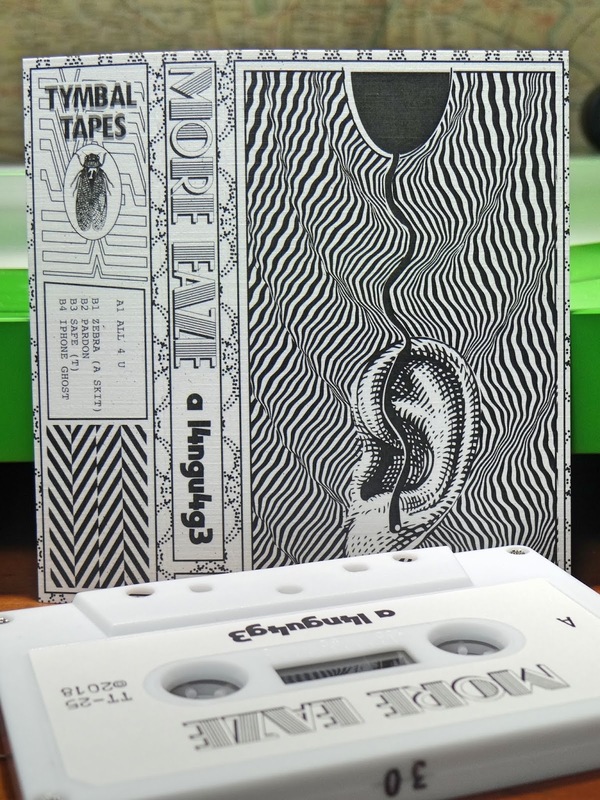 Definitely worth keeping an ear on this project and obtaining some form of their releases.